Ira Rosenberg, who rose from modest roots in Malden to own a chain of auto dealerships in Greater Boston and in Maine, died last week. He was 82, and had homes in Marblehead and Boca Raton, Fla. The son of a butcher, Rosenberg faced daily anti-Semitism as a child to and from school. “There was always a group of non-Jews ready to beat us up and call us names. I don’t believe Jews should turn the other cheek; they should fight back,” he told the Jewish Journal in an interview last year. When he was 17, Rosenberg joined the Navy. He was stationed on the USS Forrestal for two years. He rose to the rank of third class Aviation Boatswain’s Mate before returning to Malden. He then enrolled at Suffolk University and also began work changing tires at Porter Chevrolet in Cambridge. In 1958, he left school and worked at Porter full time. “The first car I sold was a ’59 Chevy Impala, with a white painted roof and turquoise bottom. I sold it for full price. I said, ‘This isn’t so hard,’” he said. In the early 1960s, his wife Judy referred him to a job at Sea Crest Cadillac Pontiac on the Lynnway. After waiting three days for an interview, he was hired and soon became the dealer’s top salesman. He then decided to go into business for himself, and used his last paycheck of $140 to open a small used car lot on Highland Ave. in Salem. His inventory included two borrowed used cars. After several years, he heard about a Toyota dealership that was for sale on High Street in Danvers. “So I went home, I got a suit, and I borrowed another dealer’s Cadillac, and drove to the Toyota dealership and went into the place like a big shot. I went into the owner’s office and we agreed on a deal in 15 minutes. Rather than cash, I offered to take over his creditors,” he said. He eventually moved from downtown Danvers to a closed doughnut shop on Route 114. After a successful start, he decided to expand and purchased a property across the street, and opened a new Oldsmobile Toyota dealership. Rosenberg then began to purchase other dealerships, and became the first Lexus dealer in New England. Eventually, Rosenberg’s Ira Motor Group expanded to seven dealerships in Danvers within 1½ miles of each other on Route 114 and included Toyota, Oldsmobile, Mazda, Pontiac, Porsche, and Audi. He first retired two decades ago. But after a few years he returned to auto sales, and purchased dealerships in Maine. He would eventually merge those operations with another company his son David had acquired, which is known as the Prime Motor Group. 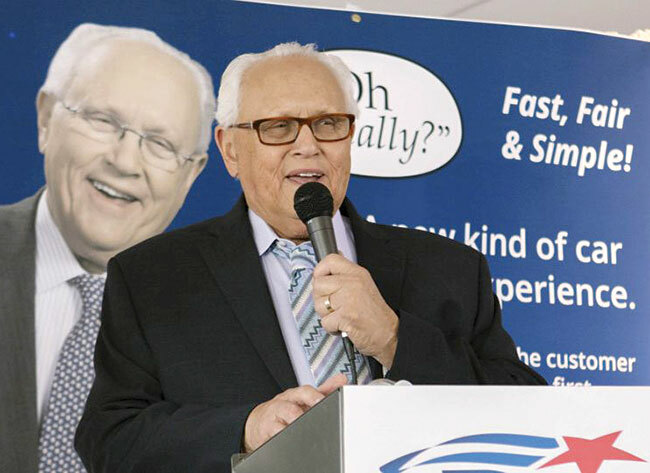 By the time of his second retirement at the age of 80, Prime Motor Group had grown to over 30 dealerships with 1,500 employees. Rosenberg was involved with numerous charities, including the Brigham and Women’s Hospital, Lown Cardiovascular Group, the Plummer Youth Promise, Sweetser Maine Mental Health Services, Salem State University, and Boca Raton Regional Hospital. In 2014, Salem State University awarded him with an honorary doctorate. He was the beloved husband of Judy A. Rosenberg; devoted father of David Rosenberg and his wife Karen, Brian Rosenberg and his husband Ferdinand, and Lori Shane and her husband Jon; cherished grandfather of Jordan Shane and his fiancé Heather Petrovich; Shelby, Amanda, Whitney and Andrew Rosenberg; and Levi, Sadie and Ella Rosenberg-Van Gameren; loving brother of Sandra Lebowitz and the dear son of the late Saul and Mollie Rosenberg. In lieu of flowers, expressions of sympathy in Ira’s memory can be made to the Plummer Youth Promise, 37 Winter Island Road, Salem, MA 01970.